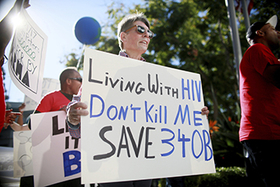 The San Diego protest brought picketers from the AIDS Healthcare Foundation and other AIDS/HIV and anti-PhRMA groups to the San Diego offices of Rep. Scott Peters (D-Calif.) to blast him for co-sponsoring a bill with Rep. Larry Bucshon (R-Ind.) that would tighten oversight of the program. Collin's office didn't have an update on when his proposals would be released, but in a statement to Modern Healthcare the lawmaker said the program's size "is well beyond what Congress intended almost 25 years ago," and it has "very little oversight."